Did you miss me? In case you’ve been wondering, I’ve been busy with real life. But let me get you up to speed. I couldn’t wait to finish last week’s graveyard shifts. 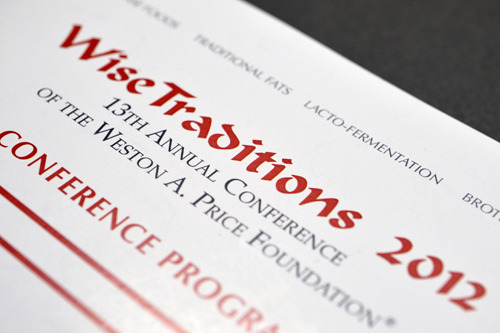 I was more than ready to hit my first ever Wise Traditions Conference – the annual meet-up of the The Weston A. Price Foundation. After my friends Liz, Laura, and Diana convinced me to join the Foundation back in March, I’d been anticipating the opportunity to eat my weight in sauerkraut and liver at the conference. 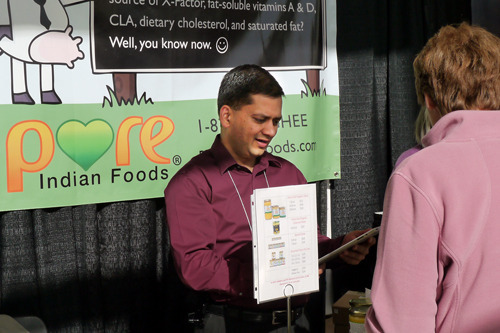 This year’s event was held at the Santa Clara Convention Center – just a stone’s throw from my house – and the theme was Nutrition and Behavior. I’d heard all sorts of raves about the traditionally prepared foods included with the conference ticket, and I was eager to stuff my face with nutrient-dense, properly prepared nosh (while learning stuff, of course). We did, however, split up to attend the conference tracks that interested us most. 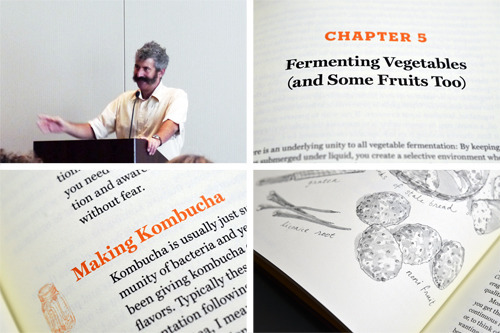 The first lecture I attended was delivered by the undisputed Yoda of fermentation, Sandor Katz. 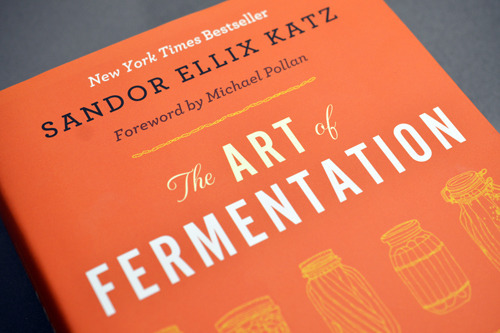 I love his book, The Art of Fermentation, and was intent on soaking up everything he had to offer on the topic of home lacto-fermentation. Clearly, Sandor’s expertise is rivaled only by his glorious facial hair. I love that his mustache is saying hello to his sideburns! Be fearless when it comes to playing around with fermentation in your home kitchen. You don’t even need to purchase a bunch of fancy cultures to get started. 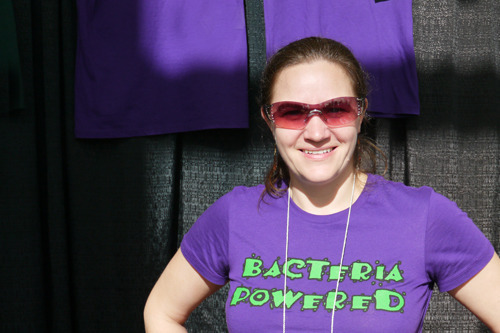 Most vegetables already carry the microorganisms that are necessary for lacto-fermentation. 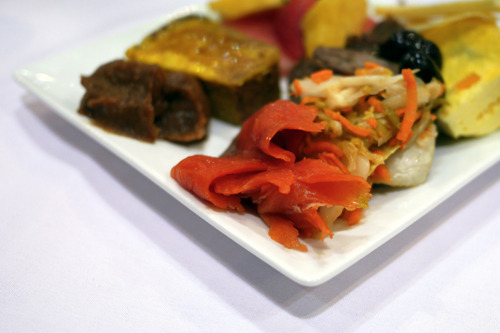 Eat a variety of traditionally fermented foods – not just sauerkraut! – to ensure a healthy immune system. Although fermented foods are an important part of your diet, they should not take the place of fresh foods. Balance is key. 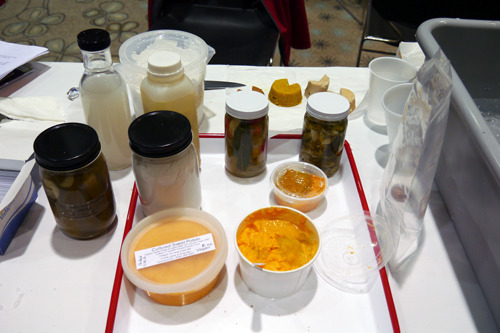 Treat fermented stuff like our ancestors did – as condiments and adjuncts to a diverse diet of real foods. After Sandor’s inspiring talk and Q&A, I was famished. 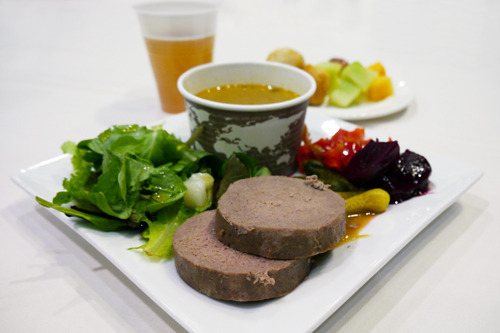 When I registered for the conference, I’d selected the gluten-free and casein-free menu options, and couldn’t wait to check out the lunch offerings. 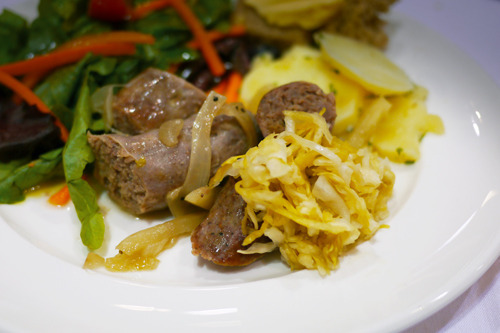 On the buffet menu: salad of baby greens, sauerkraut, grilled pork sausages, beef sausages with fennel and sweet onion, molasses baked beans (which I skipped), warm Bavarian potato salad, baked apples with raw honey (also skipped), gluten-free bread with ghee, and herbal tea. As a recovering carbaholic, I really wanted to try the gluten-free bread made with sprouted, fermented grains (or, as the Weston A. Price crowd call it, “properly prepared” grains). But after just one bite, I pushed it aside. It was tangy and dense, and nothing like the crusty, fluffy, maliciously delicious stuff that I used to love. I think I’ll just stick with meat and vegetables. After lunch, I attended Brandon Sheard’s lecture on the science and art of meat curing using simple, traditional, preservative-free methods. I couldn’t stop raving about Brandon’s presentation. The man respects his pork, and he’s got me thinking about having him teach a butchering class for me and my pals in the near future. The final lecture I attended on Friday was Julia Ross’s “Insomnia: The Impact and Cure of This 21st Century Menace.” As a foggy-brained zombie drug dealer, I picked up some fantastic tricks and tips to deal with my sleep-related woes. 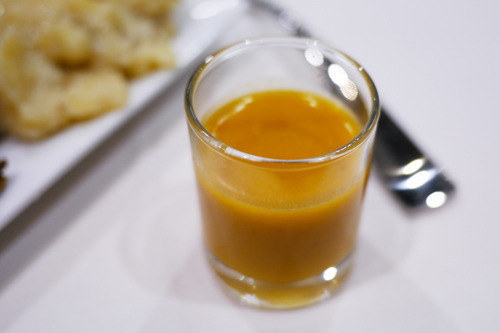 …and pumpkin panna cotta for dessert. 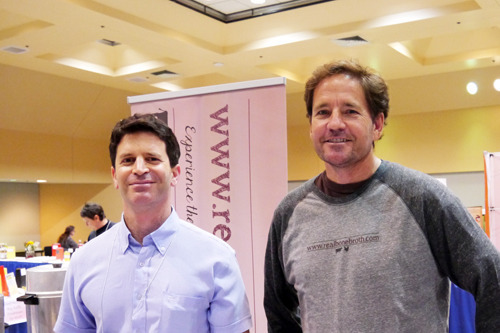 On day two, I attended just two lectures: Chris Masterjohn’s “Meat, Organs, Bones and Skin: Nutrition for Mental Health” and Chris Kresser’s “The Gut, Brain, & Skin Connection.” Both talks were a welcome reminder for me to incorporate more meat, offal, and bone broth into my daily meals. Yes, I know I’ve learned this lesson before. But sometimes, I need to be told over and over and over again before a concept takes hold. I spent the rest of the day happily perusing the different vendor booths and stimulating the economy. One of the best things about conferences like this one is the opportunity to meet the passionate owners of small mom ‘n pop enterprises that produce high quality foodstuffs. 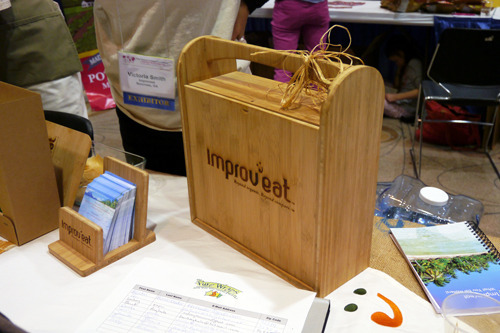 Want to check out some of my favorite products and vendors from the conference? 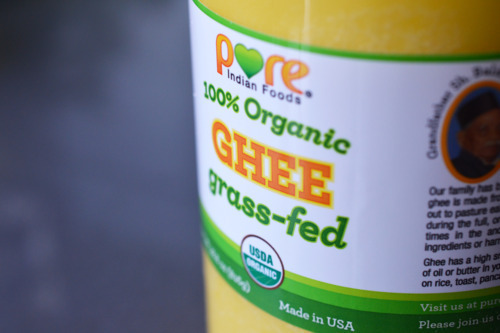 When I’m too lazy to make my own ghee, I always crack open a jar of Pure Indian Foods. Sandeep and his family have been producing ghee for five(!) generations. It’s delicious, 100% organic, and made with grass fed dairy. Can you blame me for stocking up on not just plain ghee, but also cultured ghee and an assortment of flavored ghee, too? 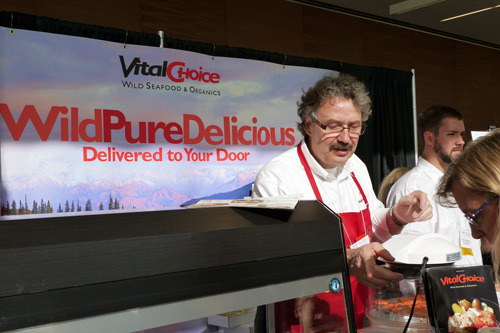 I also spent a lot of my hard-earned moola at the Vital Choice Wild Seafood booth. 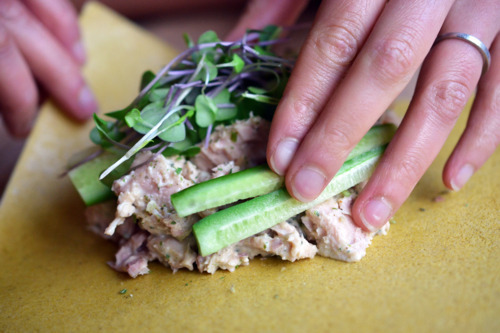 Everyone recognizes the importance of eating more fish, but it can be difficult to find a trusted source of healthy and sustainable seafood. Luckily, Vital Choice fits the bill. 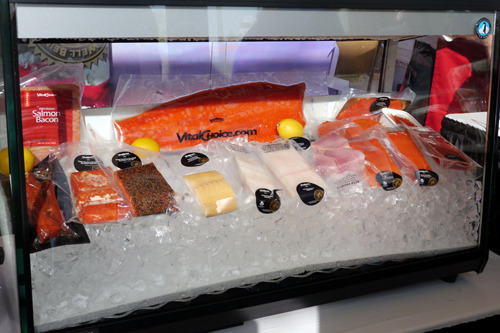 I sampled lots of Vital Choice’s offerings, but my favorite items were the canned Ventresca (albacore belly in olive oil) and the Wild Red (sockeye salmon with skin and bones). I think I cleaned them out of both items, but hey – someone’s gotta do it. So long as my supplies last, I’m going to keep a BPA-free can of fish in my bag at all times. It’s my hunger insurance policy. 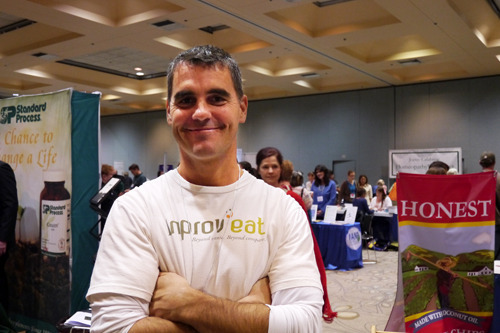 I was also excited to finally meet Todd Fitts, the founder of Improv’eat. Loyal readers know I’m always trying to find new fillings to stick in Improv’eat’s Pure Wraps. I’m head over heels in love with these Whole30®-approved wraps. I’m glad I had a chance to chat with Todd and thank him in person. He’s made eating with my hands a MUCH less messy affair. 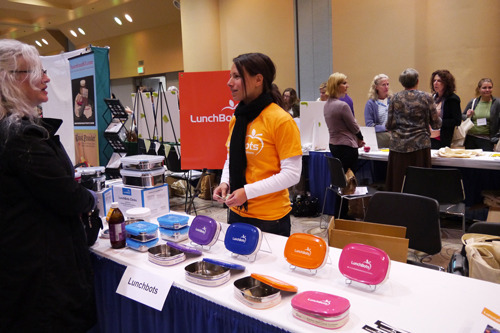 When I wasn’t circling the vendor tables like a hungry vulture, I hung out with my pal, Jackie, who was at the conference to display and sell her amazing stainless steel, eco-friendly containers, LunchBots. 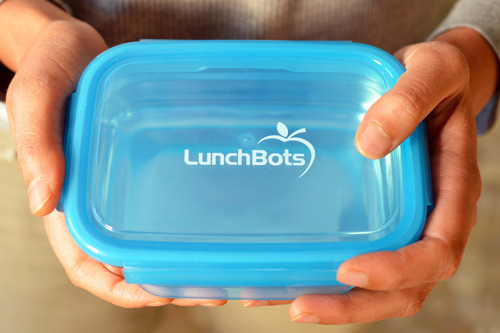 I love mine, and pack our whole family’s lunches and leftovers in ’em. 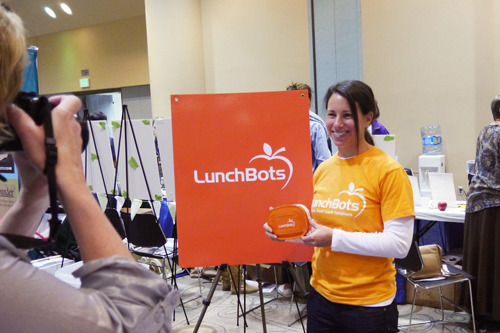 I swear: I have a really hard time containing my excitement for LunchBots. In fact, I think I owe Jackie an apology for butting in anytime a conference attendee asked about her containers. 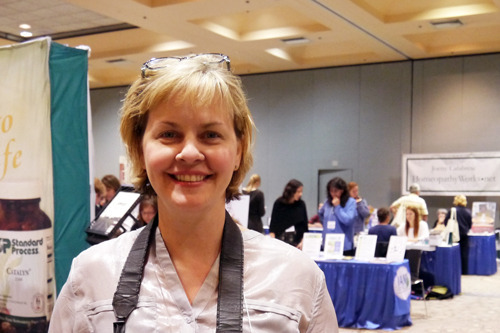 While I was visiting with Jackie, I got to meet Ann Marie of Cheeseslave. 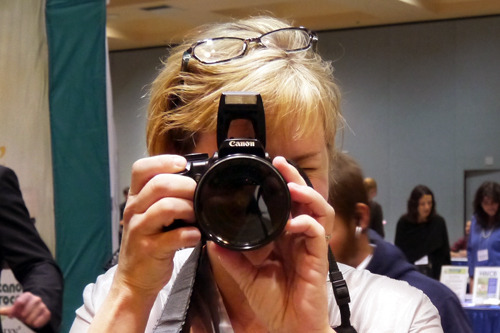 We shared a very meta moment: We both took photographs of each other taking photographs of each other. I’ll admit to being a little nervous about how I (and other Paleo eaters) would be received at the Weston A. Price Foundation Conference. Although I’m a big fan of WAPF, some prominent WAPFers aren’t too keen on Paleo (or at least “The Paleo Diet” as originally articulated by Loren Cordain back in the day). But my fears were dashed by the warm welcome I got from Ann Marie. We may not see eye-to-eye about Paleo, but when push comes to shove, we’re not all that different. 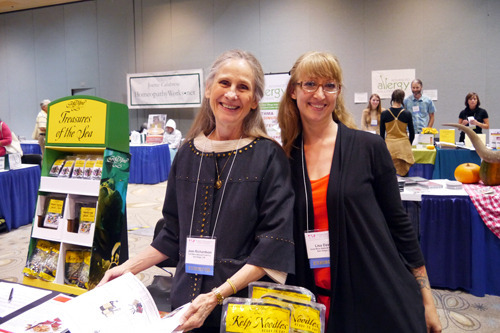 Ann Marie and I are just a couple of mommies who want to feed the best foods to our families. 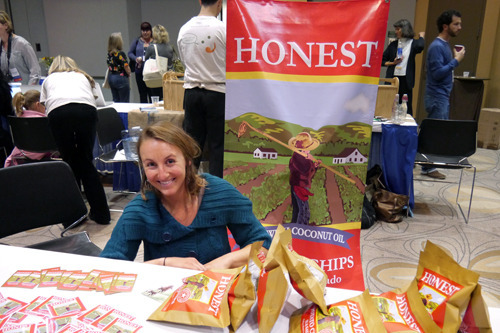 Once I flipped back into consumer mode, I moseyed on over to the Honest Chips booth where I sampled some of the yummiest potato chips around. 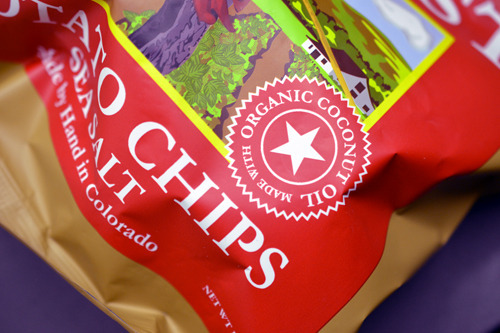 Plus, they’re fried by hand in coconut oil! Let me say that again: COCONUT OIL! I may have bought something like 25 bags. All kidding aside, the story behind chips is really inspirational. Read about it here. 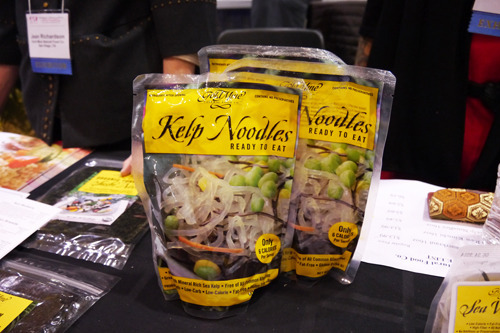 I’m a big fan of kelp noodles (I have recipes for them on my blog and in my iPad® app, remember? 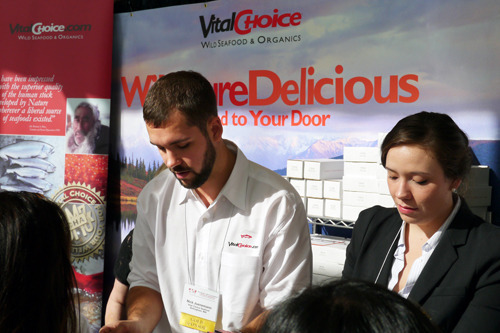 ), so when I came across the Goldmine Natural Food Company booth, I had to stock up. And then: One of my hands-down favorite discoveries at the conference. I learned that you can have frozen bone broth shipped to your doorstep. Really. I am not messing with you. I’ll still make my own bone broth (with either a slow cooker or pressure cooker), but for those of you too busy, sick, or lazy to bother, Real Bone Broth may be just the ticket for your gut-healing needs. 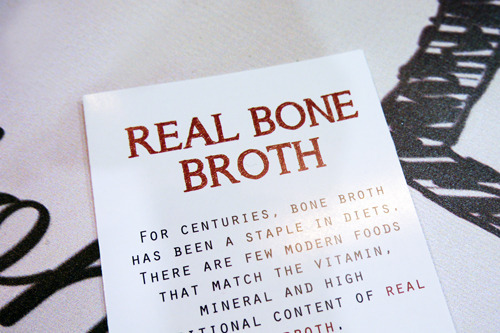 Again: THEY WILL SHIP BONE BROTH TO YOUR HOME. Awesome, right? 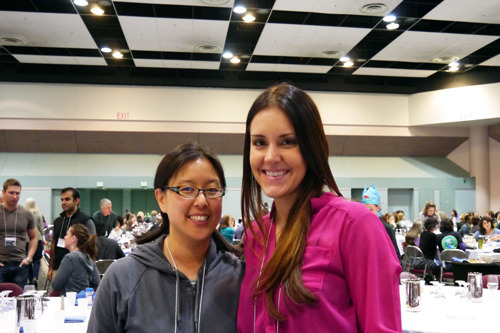 Between all the shopping and networking, I barely had time to squeeze in a quick lunch at the conference on Saturday. My meal consisted of a green salad, chicken soup with vegetables, braunschweiger, Amish mustard, fermented beets, olives, cornichons, fruit salad, and macaroons. Our Paleo posse had intended to stay for the Saturday dinner banquet, but frankly, I was bushed and wanted to spend some time with Henry and the Double-Os, so we all played hooky and grabbed (bunless) burgers at Steak Out instead. When the third and final day of the conference began the next morning, I was still feeling delinquent. I skipped out on the a.m. talks to spend more money in the vendor area. Clearly, my passion in life is sniffing out yummy yums that won’t aggravate my tummy tums. 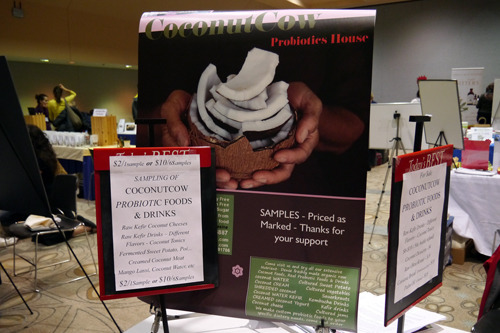 One booth that piqued my interest was Coconut Cow. 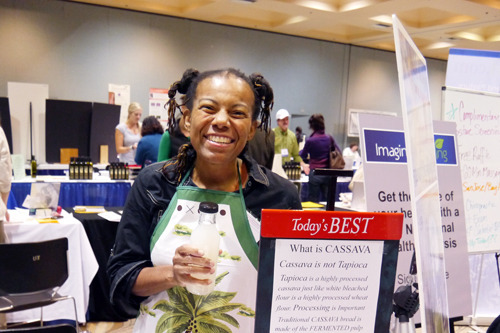 Coconut Cow offered lots of unusual products to sample, including fresh coconut cream, coconut cheeses, fermented sweet potato and mango purée, and cassava bread. I had to stop and try everything. Besides, how can anyone pass up owner Jolie’s infectious smile? My final mission of the day was to procure a continuous kombucha brewing system from the Kombucha Mama herself, Hannah Crum. Henry and Big-O LOVE kombucha, and I’d been on the hunt for home-brewing supplies. 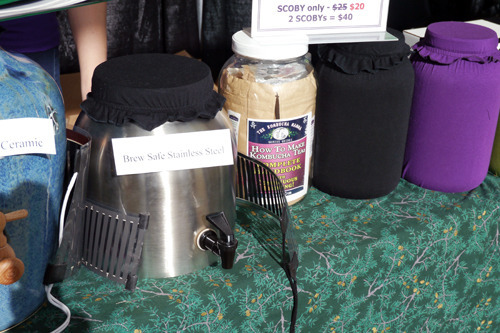 Luckily for me (and other conference attendees), Kombucha Kamp is the place to get everything necessary to brew safely and economically at home, from scobies to pH strips. My package from Kombucha Kamp hasn’t yet arrived in the mail, but Big-O’s already dreaming up flavors and designing labels for our homemade booch. 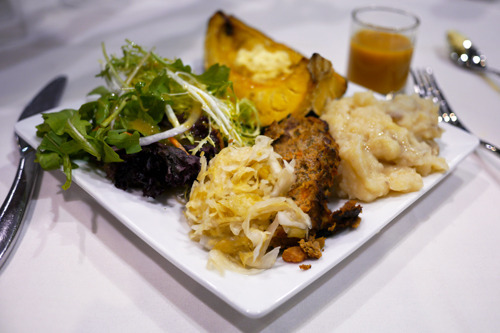 Our brunch buffet – and final meal of the conference – included sliced fruit, salmon lox, cheese, vegetable frittata, beef and pork sausages, sauerkraut, fermented apple butter, gluten-free french toast, maple syrup, and kombucha. I had time for one last lecture on “Marketing with Facebook and Blogs,” led by Ann Marie Michaels. The presentation inspired me to be a better blogger…and I think I need to start by taking fewer breaks from blogging. All in all, I had a fantastic weekend. I’m so thankful for the opportunity to attend the Wise Traditions Conference. I was able to connect with my buddies, meet new ones, and learn a ton – all without having to sleep in a hotel. Geez. Just look at that picture. Liz – the one and only CaveGirl Eats – totally towers over me – both literally and figuratively. All y’all MUST pre-order her new book, Modern Cave Girl: Paleo Living in a Concrete Jungle. I’m getting it in the hopes that someday, with lots of practice and work, I can learn to be as witty, droll, purty, and gracious as she is. 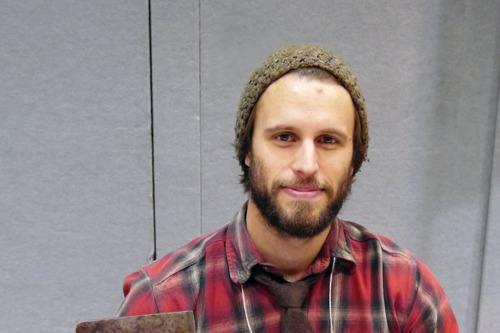 I’m all conferenced out until next March, at which time I’ll be speaking at PaleoFX 2013. Tickets are available now by clicking here. So, who’s joining me in Austin? Previous Post: « Paleo Emergency Kit & Steve’s Original Giveaway!